Height: 38 1/2 in. 97.8 cm. 49 1/4 by 41 1/4 in. 125 by 105 cm. 8 1/2 by 14 3/8 by 11 3/4 in. 21.5 by 36.5 by 30 cm. 26 by 23 by 19 in. 66 by 58.4 by 48.3 cm. 22 7/8 by 23 3/4 by 16 7/8 in. 58.1 by 60.3 by 42.9 cm. Height: 33 13/16 in. 85.9 cm. 17 3/4 by 14 1/4 by 10 1/8 in. 45.1 by 36.2 by 25.7 cm. 21 1/8 by 14 1/2 by 8 3/8 in. 53.7 by 36.8 by 21.3 cm. 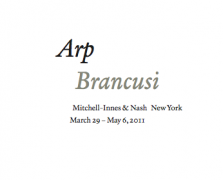 Mitchell-Innes & Nash is pleased to present Arp/Brancusi, an exhibition of sculpture and painted relief works on view at 1018 Madison Avenue, New York, March 29 – May 6, 2011. The exhibition will include a focused selection of works by Arp along with two small sculptures by Brancusi, offering a rare opportunity to view these two 20th Century masters side by side. Sculptures in wood, bronze and marble spanning a 50-year period will be exhibited. The Arp Stiftung, Germany, and museums including the Museum of Modern Art, New York and the Hirshhorn Museum and Sculpture Garden, Washington, DC, along with several private collectors, have lent their work. The exhibition will be accompanied by a fully illustrated catalogue with a scholarly essay by Dr. John Tancock. Because of their use of abstracted, somewhat amorphous forms relating to the natural world, Arp and Brancusi are often linked. Only a decade apart in age, but a generation apart in their development as artists, Arp and Brancusi are thought to have crossed paths once in Paris. 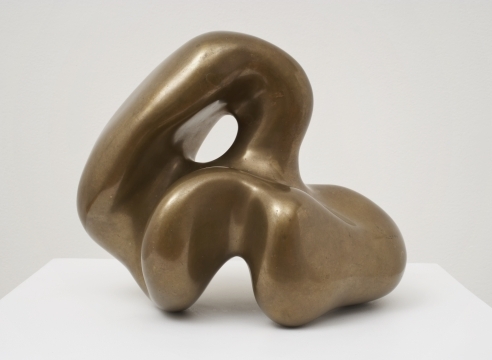 Arp would later cite Brancusi as an influence, even composing a poem in his honor. However, as noted in the catalogue essay, the two artists had radically different approaches to their work. Brancusi sought absolute perfection in his sculpture and revisited the same forms throughout his career while Arp valued spontaneity and his sculptures demonstrate a lively and diverse visual vocabulary. Constantin Brancusi was born in Romania in 1876. He received traditional sculptural training in Romania and apprenticed briefly in Rodin’s Paris studio before rejecting the representational tradition in favor of investigations into balance and reductive form. He is considered a pioneer of abstraction, and his sculptures are known for their extreme polish and sensitivity to materials. Brancusi died in 1957. Jean Arp was born in Strasbourg in 1886. As a sculptor, painter and poet he was active in several diverse art groups including Der Blaue Reiter, with Wassily Kandinsky and Franz Marc, and the Cabaret Voltaire, where he was a founder of the Dada movement. He was later affiliated with the Surrealists in Paris. He died in 1966.